If you’re a massive Harry Potter fan like myself, then you will probably have made the same shrieking noise that escaped my mouth when you heard the news that JK Rowling’s ‘Pottermore‘ website is being relaunched. The relaunch is going to be a radical overhaul with exciting new digital features which reflects the publishing worlds new interaction with everything digital. So what exactly is the purpose of this relaunch? Well, in simplest terms, the relaunch is refocusing itself on pleasing existing and current Harry Potter fans. Previously, it had attempted to introduce the series to new readers, whereas after the release of all seven books and the eight films it is now becoming a homage to the franchise and a place where us readers who have grown up with HP can explore the world further. We all enjoy reading new books, and when books such as the HP series become such a massive success it is hard to pin point why it became so huge. However, it is important to remember that content ideas for any book are always a response to market demand. Books have to have a purpose to be published because publishing is a business which needs to succeed like any other. 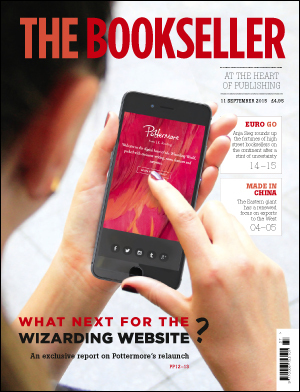 JK Rowling’s books became so hugely popular that the series and author have grown into a brand of their own, and because of this the brand can now be used as its own marketing tool, to enhance and extend the world further. What will the website offer us as readers? Now that many of the children who grew up with Harry Potter have grown into young adults, the old website found that it was targeting the wrong audience. With the banishment of the gaming ideas and ‘spells,’ the new website will focus on three times as much content as the previous version, taken from many different sources which will create an immersive atmosphere which us HP fans can scurry around and explore. Possibly one of the most exciting features is that its all going to be designed for iPad and smartphones, so we can swipe, tap and touch our way through the magical world we are never going to be ready to let go of. Excitingly, the website will also be selling all seven e-books which again shows the evolution from the classic paperback series. To me, it seems like this is a perfect tribute to us readers, Harry Potter has grown up, we have grown up, and technology has grown up. But through this radical new re-launch ‘Pottermore’ will ensure that we can continue to get our magical fix, whenever and wherever, we please.